October 8, Saturday...After reviewing sketches, Peta-Gaye and Kerrolyn worked on a sketch combining all of the elements. The larger elements ie. tables, pottery wheels, stools were moved in the ceramics studio to "open" the space. 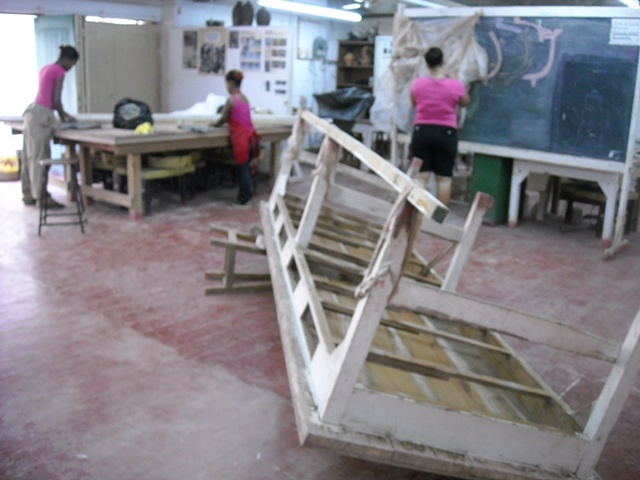 Kerrolyn Douglas, Peta-Gaye Bellas and Amoy Durrant (from L to R) began to work on their individual elements, clay "waterfall", clay bed, plastic funnel form, respectively.